(CNN) The gunman accused of killing four people at a Nashville-area Waffle House was arrested Monday after a frantic manhunt, police said.A tip from the community led to Travis Reinking’s arrest shortly after 1 p.m. in a wooded area near his Nashville apartment, Metro Nashville Police said. He was booked into Metro jail Monday night on four counts of criminal homicide.The arrest came roughly 35 hours after Reinking unloaded an assault-style rifle on customers and employees at the Antioch restaurant early Sunday morning. All of those killed were under 30. Two others were injured. Jim Bohannon talks with RICH EMBERLIN is a 30-year law enforcement veteran who served most notably with the Dallas Police Department’s elite units, including Dallas SWAT (Special Weapons and Tactics) and the Criminal Intelligence Unit-Dignitary Protection Squad. He was also assigned to the Office of the Chief of Police as a liaison to the Department of Defense, where he facilitated training exercises for the special operations community. Rich is a veteran television personality and subject matter expert who has appeared on A&E Networks’ documentary series Live PD and contributed pieces on policing to FoxNews.com. (CNN) The Democratic National Committee is suing the Trump campaign, Russia, WikiLeaks founder Julian Assange and several relatives and associates of President Donald Trump alleging a grand conspiracy that harmed Democrats through WikiLeaks’ publication of internal party emails during the 2016 presidential campaign. 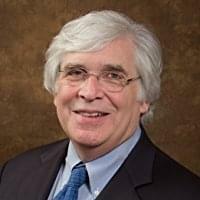 JAMES HIRSEN, J.D., M.A. in Media Psychology, is a New York Times best-selling author, international business attorney, news analyst, cultural commentator, and social media scholar. Highly sought after for his expertise on a host of matters, Hirsen has appeared on numerous television broadcast networks. He is also a frequent guest on broadcast, satellite, and Internet radio stations around the globe and is a well-known public speaker in the legal, business, news, entertainment, and faith communities. In his enduring weekly column for Newsmax.com, The Left Coast Report, Hirsen features his commentary on the entertainment, political, cultural, ideological, and social media worlds. In THE WOLF AT THE DOOR, veteran California attorney and elder financial abuse writer Michael Hackard draws from forty years of legal experience to advise families, caregivers, and professionals who work with seniors what elder financial abuse is, how to identify it, and—most importantly—what to do if abuse is suspected. As the baby boomer generation rapidly ages into retirement, elder financial abuse threatens to become a national epidemic. If not addressed early and aggressively, this unique form of exploitation can tear families apart, leaving shattered relationships and depleted bank accounts in its wake. 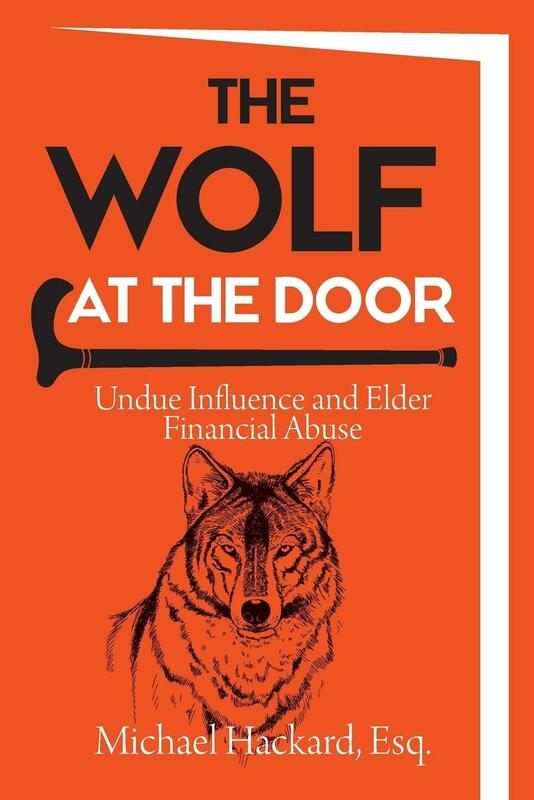 You may not be able to prevent elder financial abuse from happening, but THE WOLF AT THE DOOR will empower you to fight back before it’s too late. 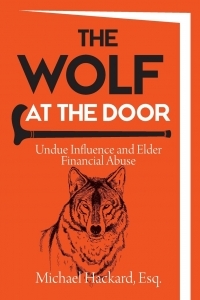 Concise and chock-full of practical information, THE WOLF AT THE DOOR is a must-have reference for anyone interested in learning about elder financial abuse and what can be done to combat it. The book is written for a general audience, and it offers case studies, research, and hard-won observations gleaned from a long career representing abuse victims and their loved ones. An index and compact sections make navigation easy, and dozens of endnotes direct readers to additional information about elder abuse, undue influence, estate planning and trusts, and more. The net profits from the sale of each copy of THE WOLF AT THE DOOR will be donated to the Alzheimer’s Foundation of America.